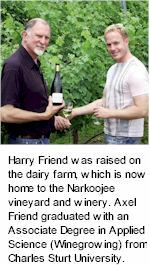 Harry Friend was raised on a dairy farm in Gippsland which is now home to the Narkoojee vineyard wineworks. He retired from his position as Lecturer in Civil Engineering at Victoria University to make good wine. Axel Friend worked the vineyard alongside his father and graduated from Sturt University where he studied Oenology. Lily Grace is vintaged from younger estate plantings, named after first grandchild, Lily Grace Friend. The kind of Chardonnay to match with rustic fare, fresh water fish, anything truffled or oven hot bread. Narkoojee are a boutique operation committed to the production of premier quality wines, reflecting both varietal and regional character. Narkoojee, meaning place of flowers, was a dairy farm owned and operated by Edna and Athelstan Friend, since the early 1940s. Their son Harry planted the first experimental vines back in 1980. The vineyard is planted to deep alluvial soils with mixtures of clay, silt, sand and ironstone gravels. The combination of location, soils and climate forms the ideal environment for production of classic cool climate wines. Chardonnay is wild indigenous vineyard yeast fermented, followed by a course of maturation in a mix of seasoned and new French oak barriques. Brilliant green gold colour. Citrus with melon bouquets, peach and stone fruit kernel. An intensely flavoured wine with melon and white nectarine on the palate, citrus, lemon zest and spicy, integrated French oak. Creamily textured with a long finish balanced by clean mineral acid. Marvelously integrated, seamless and ripe, the perfect wine to accompany white meats and the freshest seafood.